• Made of stainless steel and durable rubber. • Works as a beer bottle opener, wine cork screw, cork lift, and foil cutter. 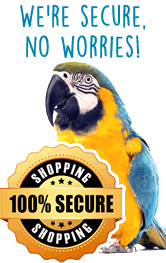 • Super durable, Jay the Parrot Bottle openers come in a variety of colors. Say hello to "Jay the Parrot" (He's the blue one) and his cousins Fred (Purple), Charlie (Green), and Joe (Orange). Last we heard they were up to no good with all those beers! But....thanks to Jimmy, we know that some parrots can "pull the cork out of a bottle of wine". Others make great feathered friends. These can also open your beer, too! Made of stainless steel and durable rubber, Island Jay's "Jay the Parrot" Bottle Opener can also cut the foil off of your wine bottle. Beautifully designed, this is a must for the Islander in your life, even if they already have a collection of bottle openers. This will be a birthday present for my sister and I know she’s going to LOVE IT!! I'm sure my son will appreciate this gift for Christmas. It will get plenty of use! So it is a practical gift! Who knew? Received my order very much on time, and products I ordered were what I was hoping for. Happy! Fun to have at a party. Its a bottle opener and it works. Looks good too. Got it for my wife and she loved it. She loves all things beach so the wine opener was a hit. Have not had it long but the quality seems good. This is so cute. It goes well with my beach themed home. Love this, it is adorable! Plan to put it in my camper.